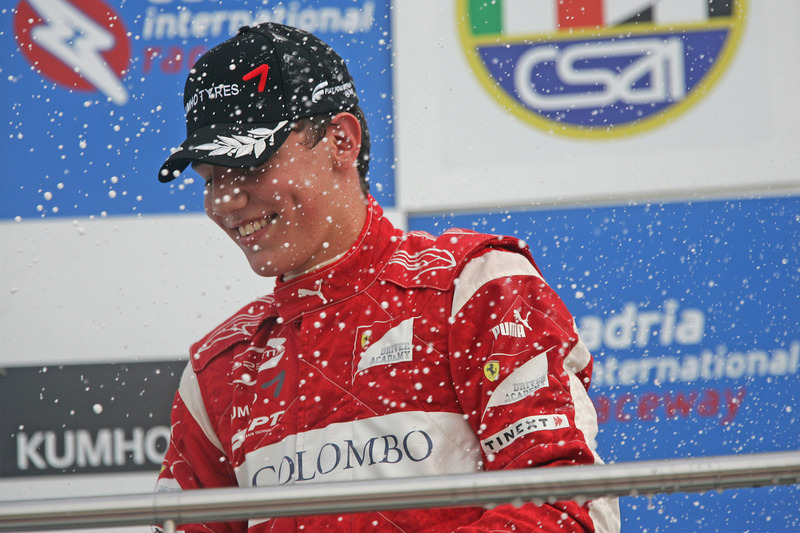 04/09/2011 - A good getaway ended in the lead in the first meters of race one and Raffaele Marciello obtained the second victory of his season in the fifth round of the Italian Formula 3 Championship's round of Adria. The 16 years old Swiss driving for Prema Powerteam obtained his first success in race one, the most rewarding point-wise, thanks to a good start allowing him to overtake his mate of the Ferrari Driver Academy, the French Brandon Maisano, with the latter unable to exploit his pole position. The young driver with Italian origins set also the fastest lap of the race in lap six and pulled away from Maisano, followed by Eddie Cheever (Lucidi Motors) solidly on the podium. Edoardo Liberati (Team Ghinzani) defended up to the finish line his fourth place obtained at the start on the BVM-Target duo composed by Maxime Jousse and Sergio Campana, while Kevin Giovesi (Lucidi Motors) is seventh thanks to a good start; the same manoeuvre did not succeed to Facu Regalia (Team Ghinzani) that ended eighth after starting from the sixth spot of the grid. Recover for Simone Iaquinta celebrating the debut with JD Motorsport's colours with a very good ninth place, best result of the season after the eighth of the season opener. The top ten was completed by Davide Roda (Prema Powerteam) and his American team mate Michael Lewis who did not manage to find what was needed to a recovery on this circuit. The Brazilian Victor Guerin (Lucidi Motors) was forced to a pit stop due to some problems on the frontend of his car and did not go beyond the 12th place, while Federico Vecchi (LineRace-CO2 Motorsport) had an excursion in the finale. The championship classification sees now six drivers Campana (81), Marciello (78), Jousse (72), Lewis (70), Maisano (70) and Liberati (69), within 12 points only, a gap that can be filled in race two whose victory awards 13 points. The appointment is now for the second race of the weekend at 15.10 (local time, GMT+2).